We cook with the stuff, shower in it, and guzzle it down after a long run. Sparkling or flat, loaded with ice or lukewarm, water is the classic thirst-quencher as old as time itself. And if you haven’t already heard, it’s super important to hydrate properly, especially during the scorching summer months. After all, our bodies are made up of 60% water. This means we have to down a heck of a lot of it to make up for what’s lost daily (and by a “heck of a lot,” we mean eight glasses). 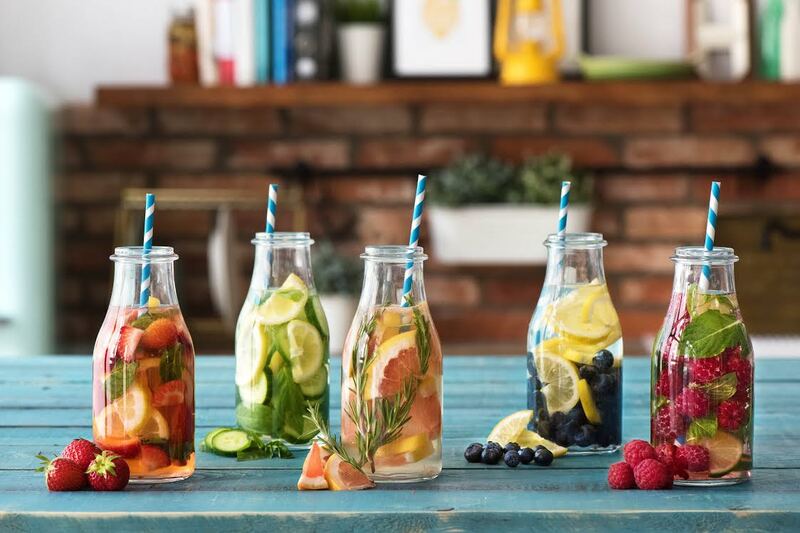 Fortunately, we’ve come up with some refreshingly tasty and unbelievably easy infused water ideas to jazz up those tasteless drinks without adding extra sugar, calories, or artificial flavors. Added bonus: they’re GORGEOUS. Is #Instadrink a thing? Let’s get it trending, people. 1. Place your herbs at the bottom of a glass container. Use a wooden spoon or muddler to tear and crush them, releasing their natural extracts and oils. 2. Add your washed fruits and veggies. Halve or quarter softer fruits like strawberries while thinly slicing tougher ones such as apples. 3. Add cold or room temperature filtered water. Ta da! You’re done. How easy was that? 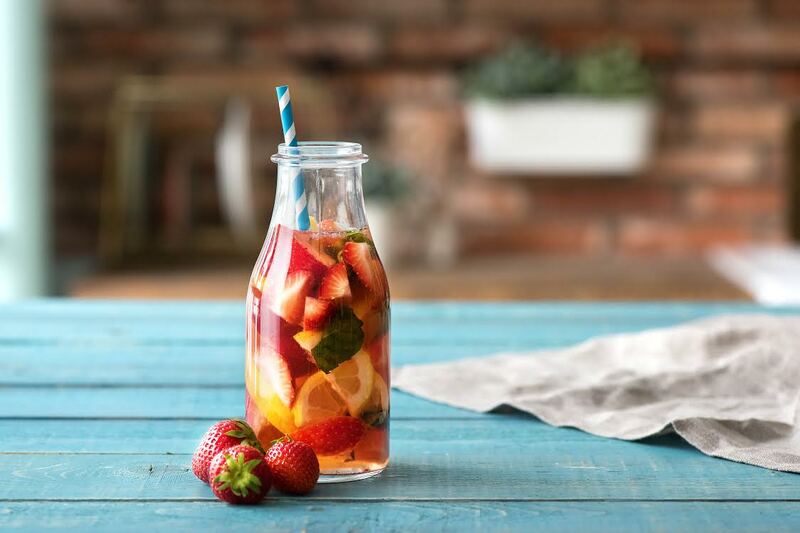 Infused water can stay out of the refrigerator for a max of two hours. After that, there’s a risk of bacterial growth, so it’s best to store in the fridge. Unpeeled citrus lends a bitter taste to water after four hours, so if you’re planning to make a big batch to last the afternoon, peel off the skin before infusing. Want to save the water for the next day? No problem! Strain out the solids before refrigerating for two to three days. 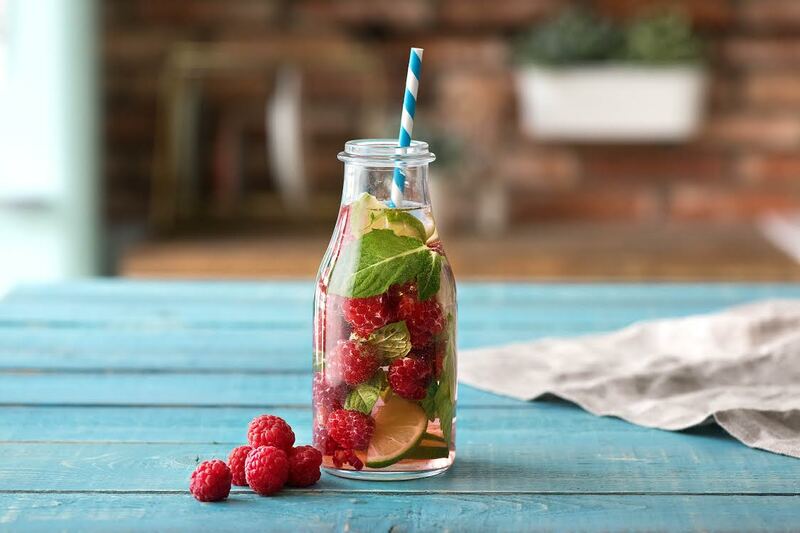 If you liked these infused waters, we have a feeling you’re going to love this watermelon mint julep recipe. I was wondering if you can put bananas in the water if infuse that banana taste? Please email answer to tish240@hotmail.com.. Thank you! Thank you for this beautiful & sensible recipe. 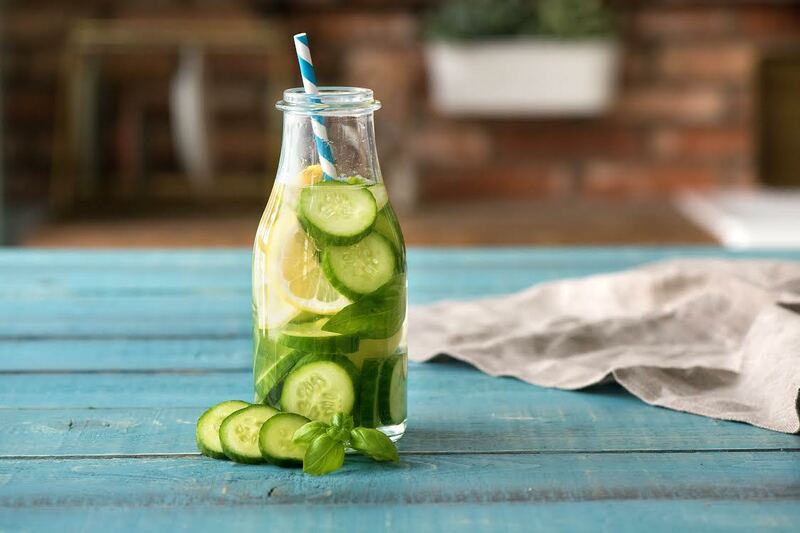 Those of you making infused water – PLEASE FOLLOW INSTRUCTIONS EXACTLY!!! 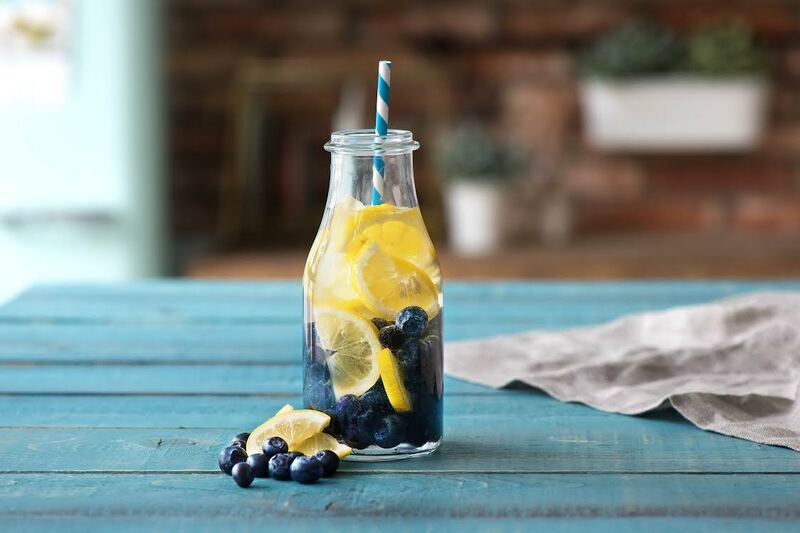 You cannot overstate this as the possibility of bacterial growth, especially botulism, in infused water or oil if instructions is possible and the health consequences can be severe. The method given here is safe and in line with the CDC guidelines. Thank you again for a beautiful and safe recipe! Barbara – so happy you enjoyed this post! Some of the recipes are gluten free and some are not. It doesn’t appear that there is a choice to go all gluten free. I have to be. What is your recommendation please. Ingredient transparency is incredibly important to us, and we set out to make sure you know exactly what’s in your food. While we don’t offer a gluten free plan, we do try to include 2-3 gluten free meals per week. All GF recipes are clearly marked as such, and you’ll have access to this information as well as the full recipe itself even before checkout. Otherwise, substituting and omitting is super easy, as everything is packaged and labeled separately. You’ll also see a full ingredients list and nutritional breakdown for each recipe on our website before you choose your meals. If you have further questions about how HelloFresh can work for your dietary needs, please feel free to reach out to our dietitian Rebecca at nutrition@hellofresh.com! You can also email us at hello@hellofresh.com or call us at (800) 733-2414. We’d be more than happy to chat with you! 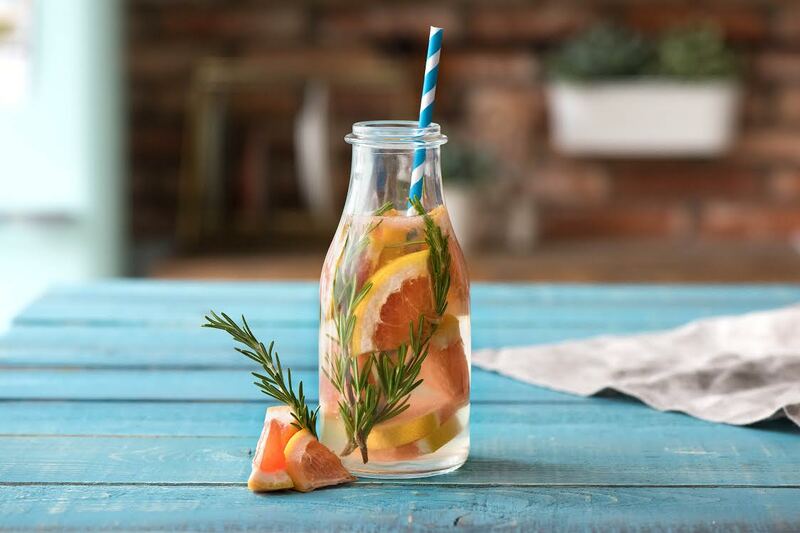 You should be careful if you take medicine to double check with your doctor or pharmacist that any fruit, herb, or vegetable infused in your water is safe to drink as there are contradictions and dangerous side effects that may happen if taken to closely together. Its a great idea to increase your regular water in-take which is obviously very important for healthy life.